In our previous post we discussed about quality of Granite tile. We learn more about. Now we will learn how to save and maintain the quality of granite tile. As we known Granite is the queen of natural stones and has a very royal look. Granite tile is the right investment choice for luxurious look of your home. It is also expensive compare to other natural stone and it flexible for any flooring option. Now it’s time to give a price which you have paid, Granite tile need regular cleaning to maintain its quality and originality. Granite is rough compare to marble tile so it has more dust absorbing power so you need to clean it on regular basis. Immediately clean up spills to prevent staining. Do not use rough sponges/scrubbers for cleaning. It may the cause of permanent scratch marks. Long time Red wine, coffee or soda may be dangerous for your granite floor or counter tops. You may use little soap mixed in water for clean the granite floor tile if the spill is not cleaned by mineral water. Paste with baking soda & water are also beneficial to remove stain from granite tiles floor. If granite is in light colour then use hydrogen peroxide to clean stains. If the granite is in dark colour then must use acetone for cleaning. It is an easy task if you follow it on regular basis for maintaining your granite floor. Take 3 cup of water and ¼ cup of baking soda and mix it. Take a soft cloth and use this mixture for polish your floor. On regular use its reflection comes out. Mix 3 cup of water and 1 cup of rubbing alcohol with 15 drop of shop. After mix you can use for polish your granite floor by a soft cloth. As the leader of natural stone in USA we provide total solution sale and safety of natural stone. Here, if you use MarbaleWarehouse cleaning product than no need to follow above guide for cleaning granite floor tile. After all for Granite floor tile safety we need regular checks to do that we mansion above but apart from it if any granite floor tile or counter top tiles cracks or chips than it is highly recommended to replace it immediately. 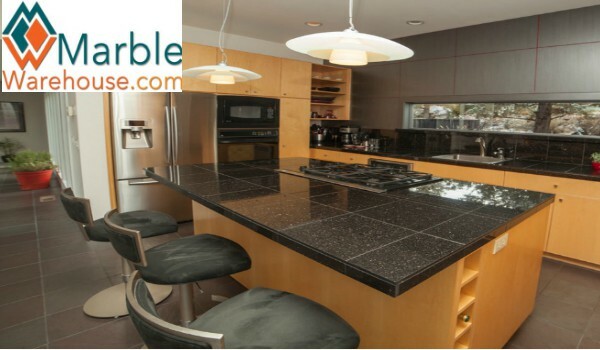 For more information feel free to call MarbleWarehouse or visit offline store at Los Angeles.